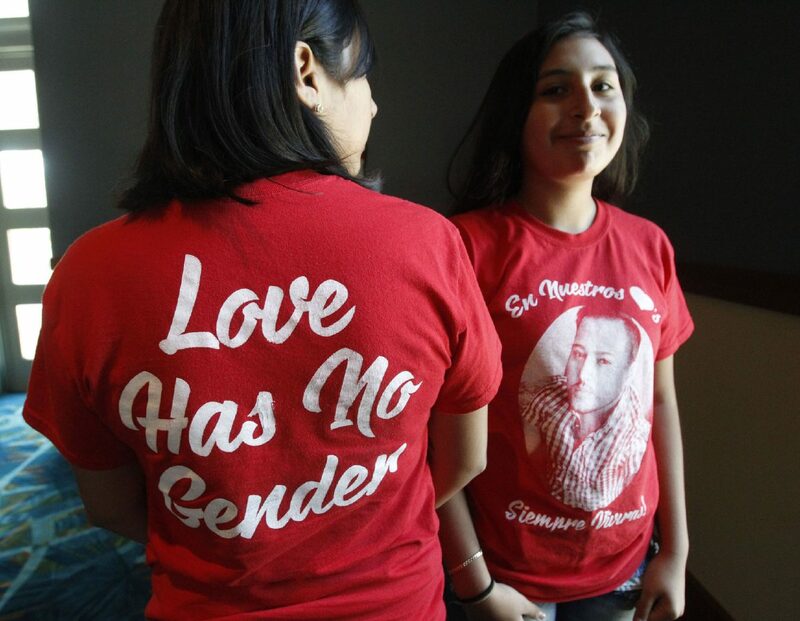 Jessica and Ruby Leal, sisters of Frank Hernandez Escalante of Weslaco, who died in The Pulse Night club in Orlando, Florida, wear T-shirts in support of their brother during a press conference for Gay Pride Week at the McAllen Convention Center Friday June 23, 2017 in McAllen. McALLEN — The family a Valley man who died last year in the mass shooting at an Orlando, Florida, night club recounted his death Friday in a small, intimate news conference in a boardroom at the convention center. Weslaco native Frank Escalante was one of 49 people who died June 12, 2016, at the Pulse Nightclub in Orlando. 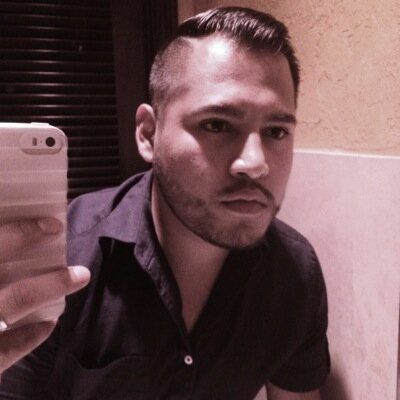 A candlelight vigil in his memory will be held tonight as part of Pride in the Park from 3 to 10 p.m. at the McAllen Convention Center Oval Park. The news conference organized by The South Texas Equality Project included Escalante’s mother Esmeralda Escalante and his sisters Jessica Leal, 20, and Ruby Leal, 14. Esmeralda Escalante spoke Friday of how she found out about her son’s death. I told my daughter Jessica to call Frank’s best friend and at around 9 a.m. the best friend told her that they had been in the club and the friend said that he made it out but was not sure what happened to Frank. After the phone call, Esmeralda told the rest of her family about the shooting and was trying to keep calm at the same time thinking about what to do next. At the time her family was living in Lafayette, Louisiana, about an 11-hour drive from Orlando. Esmeralda knew she had to go, so she told her family to pack and they headed to Florida. During the trip she knew something had happened to Frank as he was not answering her calls. As a mother, she wanted to be there to say goodbye to Frank, but then Frank’s friend called back and said that he was not on the list of those who died. “We were happy and we still have hope,” Esmeralda said. They arrived in Orlando at 2 a.m. Later that morning they went to the local hospital where they eventually found out Frank was dead. 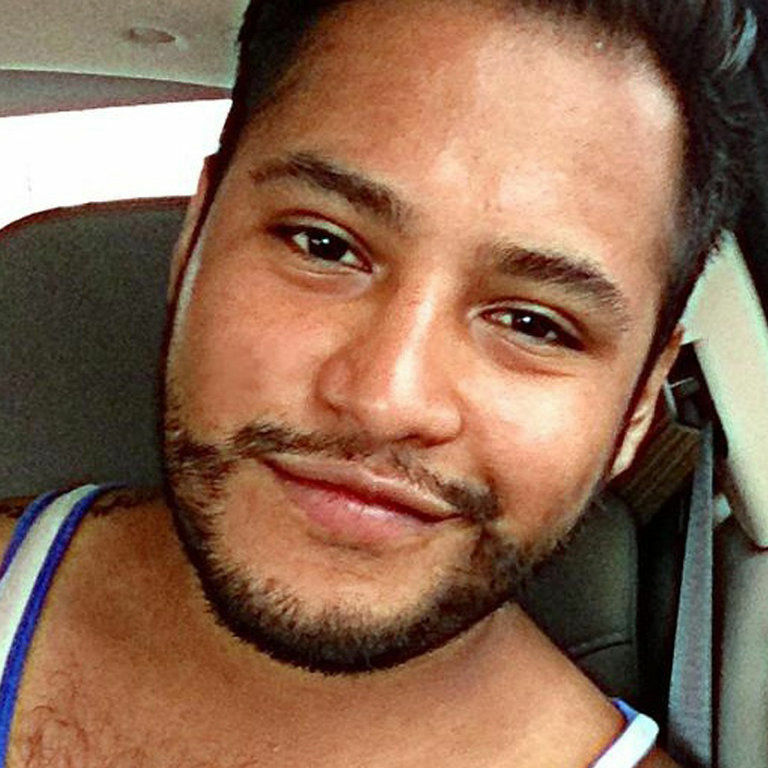 A year later, after some time to come to terms with Frank’s death, the family expressed a desire to speak to the Valley about Latino culture and homophobia. “I only wish I had been more accepting of Frank when he was younger,” Esmeralda Escalante said in Spanish. “I could have been more welcoming to Frank’s partner but I just didn’t have the words. “I don’t want any other mother to have the regrets that I have,” she said in the statement. Recalling how her son Frank would always be the center of attention brought laughter from his mother, who said he was always a nice person. His sister Jessica recalled some of the challenges her brother faced being gay in the Rio Grande Valley. After that she learned to say her sister or her friend helped her do her hair. Valerie Cantu Severn, vice president of the Stonewall Democrats of the RGV, and Erika Galindo, of the Human Rights Campaign also addressed Latino culture and its impact on LGBT youth as well as recent legislation that affects the community. As per the Escalante family and STEP, two college scholarships will be awarded in memory of Frank Escalante to LGBT youth Saturday at Pride in the Park.